Doncaster Knights boast one of the best, if not the best, playing surface in the Championship. But hopes that the £300,000-plus pitch laid last summer would enable Knights to play their expansive brand of rugby throughout the season and therefore win more games have so far failed to materialise. Knights’ home record going into Saturday’s Championship clash against Hartpury College at Castle Park is their worst in recent years. 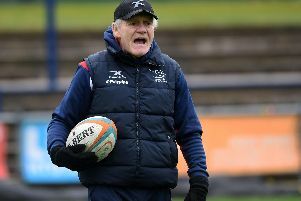 “We’ve been poor at home all season for some reason,” said straight-talking forwards coach Glen Kenworthy reflecting on Saturday’s hard-earned 19-17 win over visiting London Scottish. “Going into the game we had something like a 28 per cent success rate at home, which isn’t good, whereas we are up around 70 per cent on the road and those figures are mad. “The people who come to Castle Park every week pay a lot of money during the season and they deserve better. “I know a lot of people probably expected us to pick up a five-point win being at home against a team second from bottom but credit to Scottish they played well on the day. “Defensively they have been sound since around October and we knew their back three forwards would be good on the ground. “We have got on a bit of a roll recently and that has been helped by the fact we are getting players back from injury and expect to have a couple more back any time soon. Up until December we were struggling with numbers in training and that had an effect on how we played in games.